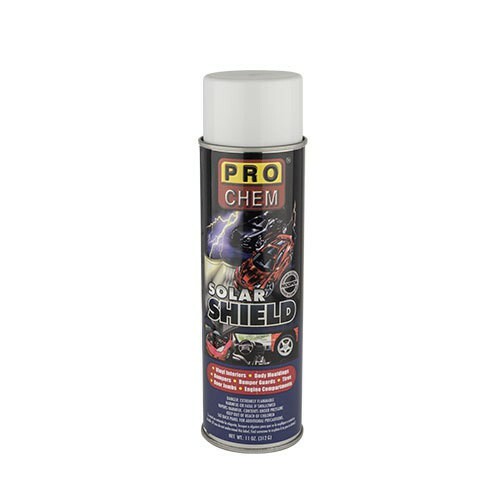 SOLAR SHIELD | Pro Chem, Inc. SOLAR SHIELD is a concentrated blend of poly and silicone ingredients that provides a tough, protective film and protects various surfaces. This product is simple to use. Spray on and buff or let dry to a like-new shine. It leaves a waterproof coating after one application and contains special additives to inhibit cracking, fading and hardening. It protects surfaces from the harmful rays of the sun by keeping surfaces moisturized. Spray product onto surface and buff or let dry to a “like new” shine. Avoid over-spraying on flooring as surfaces may become slippery. Thoroughly ventilate the car interior before driving.